Serial number range for the 1954 Fender Telecaster are generally 0100 to 6000 (stamped into the rear metal neck plate). Early 1954 Teles can still have the old style serial number stamped on the bridge plate (0100 to 5500). The 1955 Fender Telecaster will generally have a serial number range of 6000 to 9000 (stamped on the neck plate). If you need to figure out the exact year of your pre-CBS Fender Telecaster, use the serial number and the general features of the guitar. See the Fender Serial Number Info web page for help determining the year. 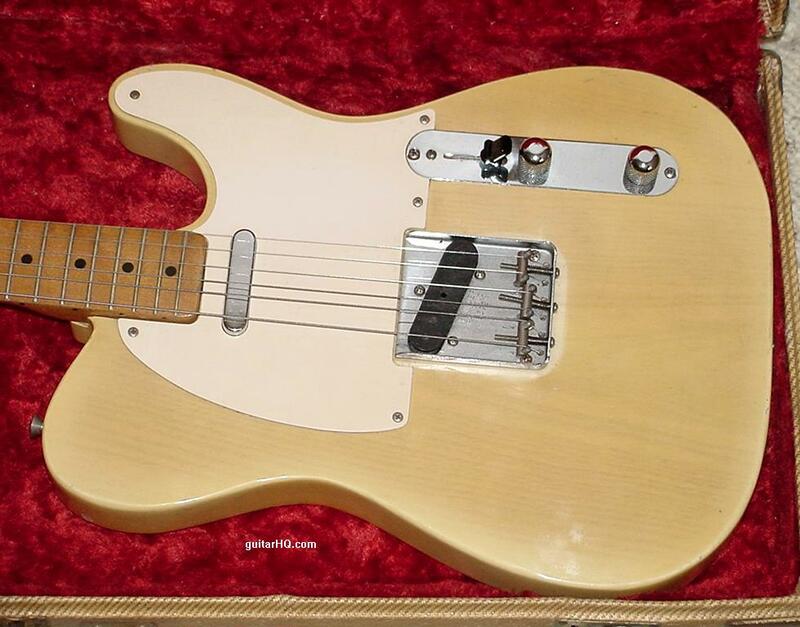 See the next year's 1956 Fender Telecaster guitar. See the previous year's 1953 Fender Telecaster guitar. Serial number on neck plate. Blond body finish has a more whitish look than the earlier "butterscotch" finish. In reality, the body finish was probably applied no differently, but the type of clear lacquer used to clearcoat does not yellow as much This gives mid-1954 and later Teles a more whitish blond look, instead of butterscotch. Because of the more whitish look, a distinct "halo" can be seen around the edge of the body that is less translucent (this halo was present on the earlier butterscotch finishes, but it was far less noticable). 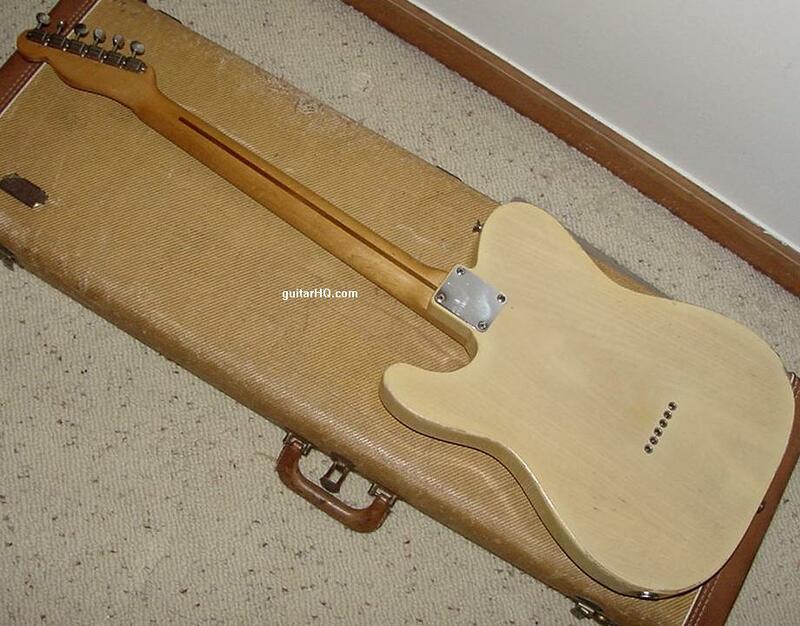 The halo was used to hide the side grain of multi-piece bodies, because Fender could easily match the face grain, but it was difficult to match the side grain. 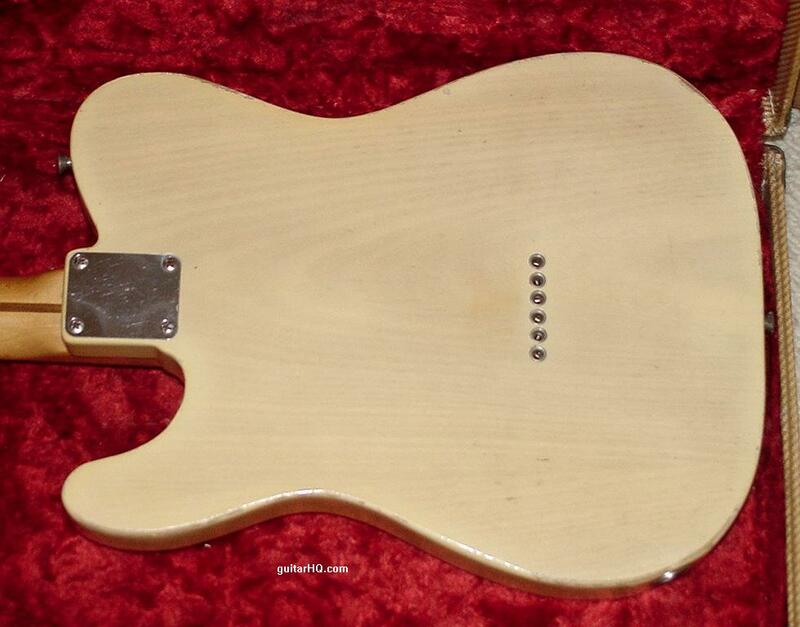 White single layer ABS pickguard .060" thick with matte backside replaces black pickguard. Bridge saddles change from 5/16" brass to 1/4" steel smooth saddles with rough finished ends. Also the angle of the string height screws changed to be about 45 degrees. Daka-Ware "Top Hat" style switch tip starts to be used instead of the round tip. "D" neck/body stamp is largely not seen after 1954 (except on an occassional neck up 1957). Case changes to a rectangle tweed case. Staggered pole pickup magnets replace the previous "flat pole" pickup in the treble position. Body date moved from neck pocket to under lead pickup (late 1955). "Top Hat" style switch tip used exclusively. 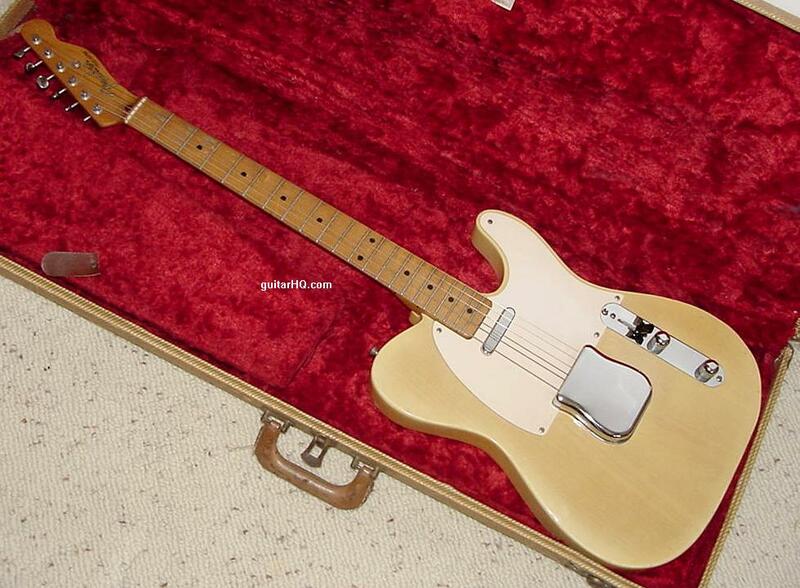 A summer 1954 Fender Telecaster with a 1955 style tweed case. smaller steel saddles. Had the newer white pickguard too.